I was delighted when social theorist D. Paul Schafer recently sent me an advance copy of his excellent new book The Secrets of Culture. Schafer’s idea that humanity needs to ‘pass out of the present economic age and into a future cultural age’ really connected with my belief that companies and business people who embrace and engage with culture will achieve superior corporate outcomes – one of the main themes of wherewordsfailblog.com. Insightful, thoughtful and enjoyable to read, The Secrets of Culture is a special book with the potential to change the way people think about the challenges our world faces today and what role culture can play to help surmount them. He argues that society today has become conditioned to see things through the vertical lens of specialisation, prone to ‘dividing the whole up into parts in order to study those parts in detail’. have become so accustomed to taking a partial or specialized approach to problem-solving — largely by creating and perpetuating separate “silos” within which all the various aspects of society are situated — that the left hand often does not know what the right hand is doing. Which is true. Governments have finance, tax, health and defence departments, while businesses have accounts, marketing, manufacturing and sales departments. It’s a common complaint amongst both public servants and employees in large businesses that effective communication across departments is highly challenging. An inability to solve problems across silos reduces the effectiveness and productivity of organisations. This silo-like structure of governments and larger businesses makes working in these organisations more appealing to specialists, and specialists more likely to be hired by the HR departments of these organisations. Because economic aspects sit neatly within silos (each department with its own budget, for example), governments in particular are accustomed to seeking economic solutions to a whole range of problems that could perhaps be better resolved by non-economic means. To set prices, to measure values, to think up equivalencies, to exchange things that preoccupied man’s very first thinking to such a degree that in a certain sense it‘s what thinking itself is. Creative people often find their solutions and derive their inspiration from a diverse range of cultural sources. Musicians can be inspired by photographs, or dancers by music, but this actually goes a step further and artists can be inspired by anything, nature, traffic, human emotions and more. People who appreciate and understand these interactions are cultured people, and cultured people think outside of silos. They know silos exist, but see them as containers from which to draw upon and cross-pollinate rather than keep separate, so it’s not unusual for cultured people to see things through a more diverse, or holistic lens than the purely economic. When Steve Jobs wanted multiple typeface and proportionally spaced fonts for the computers he was developing, the solution he found wasn’t a high-tech, modern or economic one, but was rather inspired by a calligraphy class he famously ‘dropped in on’ at college, where he learned about an ancient art form from a culture different to his own. This is a classic example of cross-silo, transcendent, culture based, creative business thinking. People who see things solely through the economic lens often only understand the value of something if a price tag is attached. When you work in the arts, these people are often the ones who are blocking your path. Arts workers have many descriptive names for such people; I remember working in an office shared by different arts organisations and whenever a grant application got rejected, or a government abolished a good arts scheme, or someone wanted an orchestra, choir or theatre group to perform for free in exchange for “good exposure”, the decision makers could be called a range of names from “artless fecks” and “suity suits” (we were in Ireland), to “beady-eyed pencil sharpeners” and my personal favourite, “the uncultured ones”. Governments and businesses are always banging on about productivity while pointing fingers and making threats. Both understand that increasing productivity builds wealth. From what I’ve observed whilst working in both the corporate and government sectors, a main area where effectiveness, efficiency and productivity is lost is at the silo walls, that is, where silo thinking meets its limits and a more holistic solution needs to be found. If we have lost one thing in the modern world, surely it is our ability to see things in context rather than in isolation. We have become so caught up with the “contents” of things that we have lost sight of the overall “context” in which they are situated. 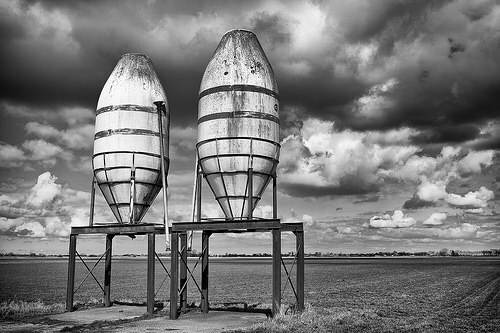 Silos can reside both in organisational structures and within the thinking patterns of individuals and groups, so what can be done about them? The usual approach to solving the structural issues of departmental silos is to create another department that is supposed to coordinate communications and shared activities across all departments. The fictional government Department of Administrative Affairs of TV’s most hilarious and accurately portrayed politician, Minister Jim Hacker from the Yes Minister UK comedy series, was just such a body, and just like in the show, real life departments like this are often expensive failures, often becoming silos of their own and contributing to the problem they were designed to solve. Such cross-silo departments face a range of challenges such as resistance to change from other parts of the organisation. Solving the structural problems of silos is difficult and there are many paths that can be taken to resolve the issues. Often this involves a complete organisational restructure that tears down the silo structures, and management consultants and trainers get rich on advising companies how to do this. As for silo thinking, it’s worth remembering, as Nietzsche and Schafer write, people are largely conditioned to view things through the narrow, vertical lens of economics or their own field of specialisation and have an inability or unwillingness to think outside or across silos. Cultured people, however, have an ability to draw on knowledge and understandings derived from outside and across silos, can see value, make connections and find solutions where ‘the uncultured ones’ can’t. Any organisation that values innovation, creativity and productivity should seek to be a cultured organisation, managed and staffed by cultured and creative people. Here are just four suggestions on how to achieve this. 1. Many employers find it beneficial to have physically and mentally healthy staff and encourage this by paying for gym memberships, influenza vaccinations, and providing generous family leave and flexibility provisions. So too should employers support the creative and cultural development of their employees. This might include assisting with the purchase of materials or providing flexible working hours for staff who play or sing in music ensembles, write books or poetry or perform in theatre groups. 2. Employers should hire cultured people from the outset. Job advertisements should specify that they are seeking to hire ‘cultured people’ and job applicants should be asked to spell out the creative and cultural activities they have pursued. Job interviews should follow such a line of questioning, asking questions like “tell us about something unique you have created, either by yourself or in collaboration with others”. 3. Encourage employees to learn an instrument, draw or sing and contribute to their course or lesson fees. Creative gardening or experimental cooking also fit the bill. Art history, music appreciation and language courses are particularly good at increasing knowledge, empathy and creativity. 4. Cultured organisations should encourage employers to attend cultural events like concerts and theatre performances and could also supply tickets for staff. I used to work for an arts organisation that provided tickets to staff to attend football matches. At the heart of implementing such strategies is developing a creative workforce with outstanding problem solving abilities and an ability to think outside of silos. But there would also be multiple spin-off benefits. Cultured people are better equipped to communicate effectively with people from different cultures and tend to be more interesting and articulate than uncultured people, while a cultured company will be better at expressing its values and putting them into action. The mental health benefits of involvement in arts and cultural initiatives is well documented and will be the subject of a later post. Tomorrow’s business and political leaders will be cultured people. This will be a necessity in an ever more competitive world where innovation, competitive advantage and peak productivity are so important. Uncultured companies, governments and individuals that lack the ability to think outside and across silos, or destroy silos, simply won’t remain competitive. Whilst economics has been the language of business and government for hundreds of years, tomorrow’s leaders will also have to speak the language of culture. Now is the time, as Schafer says, to move into a future cultural age. Previous Post The kids are alright. Reflections on music education and culture.